Born Tel Aviv Israel, Michael fondly recalls his earliest culinary education alongside his mother’s dishes. Ignited with a passion for food, Michael set his sights on a culinary career. With only some experience helping in the kitchen at home, Michael first entered the restaurant industry as a Pastry Chef. With a desire to grow in the business, Michael went to attain his education at the Culinary Arts Academy in Paris. Michael later cut his teeth under several renowned Chefs in the industry including the Head Chef of the Academy were he was formally educated and the Head Chef of the 2 Michelin-star restaurant Sugar Club in London. In Israel, he spent time refining his skills at some of the city’s finest restaurants. Looking forward to putting his own unique twist on the Australian food scene, Michael arrived in Sydney in 2005. Michael joined the staff of The Bathers’ Pavilion as Sous Chef in the fine dining Restaurant. After leaving Bathers’ in 2007 Michael has worked at Pink Salt in Double Bay and numerous restaurants within the 100 Group, located in The Rocks in Sydney. 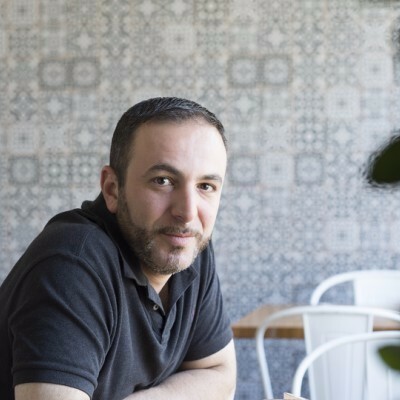 Michael had a successful catering business, de Pomegranate Catering, but now owns and runs the award winning Kepos Street Kitchen in Redfern, Sydney as well as Kepos & Co in Waterloo which opened in June 2015. Kepos Street Kitchen burst onto the Sydney dining scene in 2012 and since then has won numerous accolades including “Best Café Food” in the Sydney Morning Herald’s Best Café Guide as well as one hat in the Good Food Guide in 2013 and 2014. The food that Michael serves at Kepos Street Kitchen draws on the best of his childhood meals mixed with his classical training. Dishes have a strong Mediterranean influence with a Middle Eastern twist. Michael’s first cookbook, “Falafel for Breakfast”, was released by Murdoch Books in September 2015. It won the Kinokuniya Bookstore’s “Cookbook of the Year”.